Mayor Muriel Bowser is implementing an initiative for construction, improvement, and repairs of alleys across the District of Columbia. This is a core activity for the District Department of Transportation (DDOT) to help improve the condition, functionality, safety and accessibility of the neighborhoods' alley network. 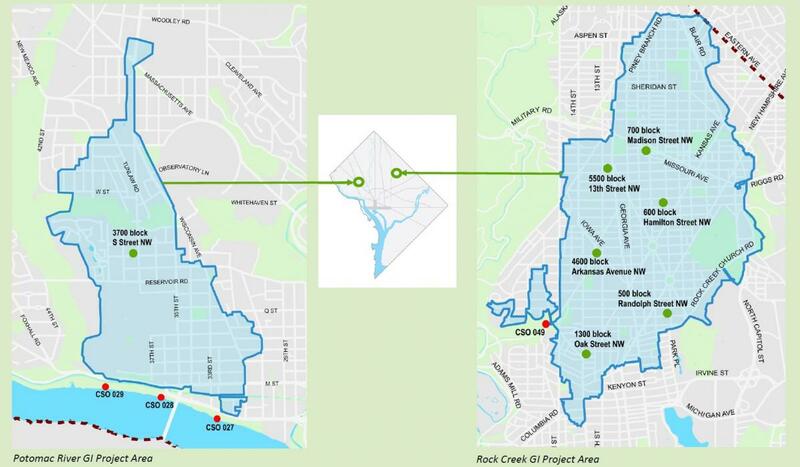 DC Water through its DC Clean Rivers Project (DCCR) is partnering with DDOT on a green alley partnership to construct permeable pavement in one alley in Ward 2 within the Potomac River sewershed and six alleys in Wards 1 and 4 within the Rock Creek sewershed. Permeable pavement is a Green Infrastructure (GI) technique that mimics natural conditions to capture (working like a sponge), filter and slow down stormwater runoff before it enters the combined sewer system. Other GI techniques include bioretention (rain gardens) and rain barrels, which are being implemented through other DCCR GI Projects. Residents and ratepayers will benefit through newly reconstructed alleys and by the implementation of GI helping to prevent combined sewer overflows (CSOs) into the Potomac River and Rock Creek. The DCCR Project includes a system of tunnels and GI practices to reduce CSOs, a combination of sanitary sewage and stormwater going into our rivers during heavy rain events. The Green Alley Partnership facilitates implementation of permeable pavement in alleys helping to reduce combined sewer overflows (CSOs) into the Potomac River and Rock Creek. Regular impervious pavement would have contributed to stormwater overwhelming the combined sewer system during heavy rain events. The partnership between DDOT and DCCR allows cost sharing between the two entities optimizing resources and expertise, reducing the financial impact to tax and ratepayers in the District. The seven alleys included in this Green Alley Partnership would have not received GI until later phases of the DC Clean Rives Project. This partnership allows DC Water to advance GI and reduce combined sewer overflows (CSOs) much sooner. The Green Alley Partnership supports and advances the District’s plan to make it the healthiest, greenest and most livable city in the nation by implementing GI much sooner than if each entity was working independently. Because of both DDOT’s and DCCR’s work will be constructed under the same effort, the neighborhoods where the alleys are located will have less construction disruption. Kickoff - April 20, 2017. Construction work anticipated to be completed in 2018. Neighborhoods with permeable pavement alleys will be notified prior to construction.